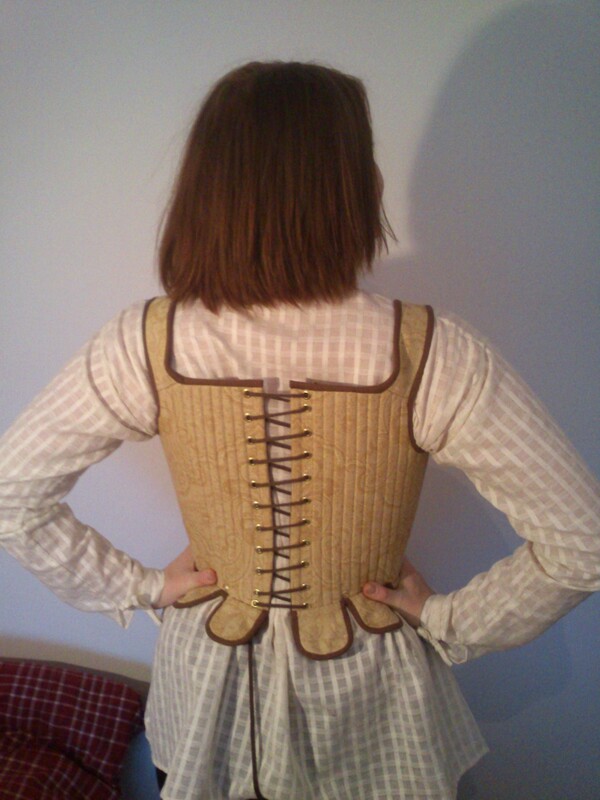 For the HSF Challenge 3: Under It All, back in february, I decided to start the foundation on my planed 1550s dress (which I still haven’t gotten around to make). So I decided to make a corset similar to theese two. 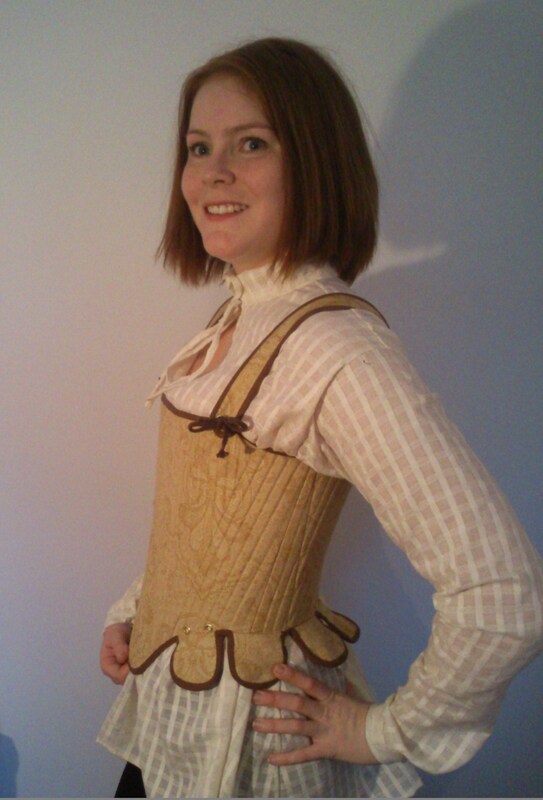 Using the corset pattern from “The Tudor Tailor”. I printed the pattern and made some changes to match my mesurments. 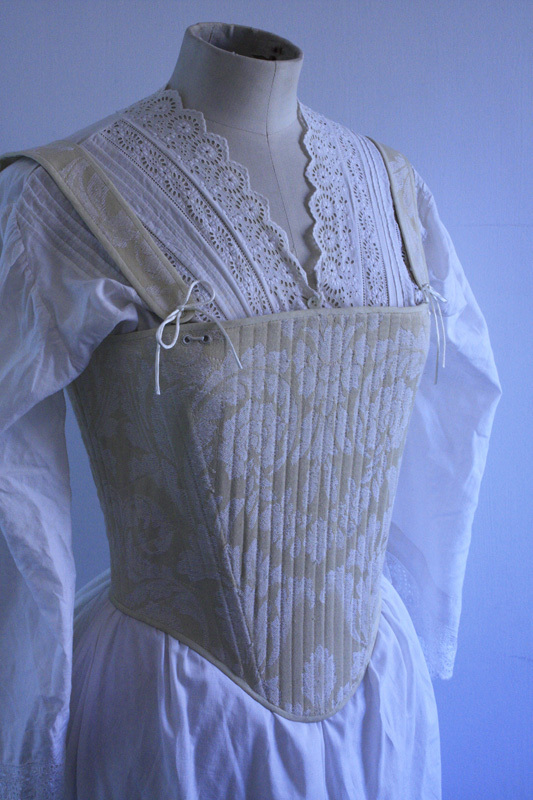 Then I cut the fabric, interlined it, and stiched the corset compleatly on the machine. 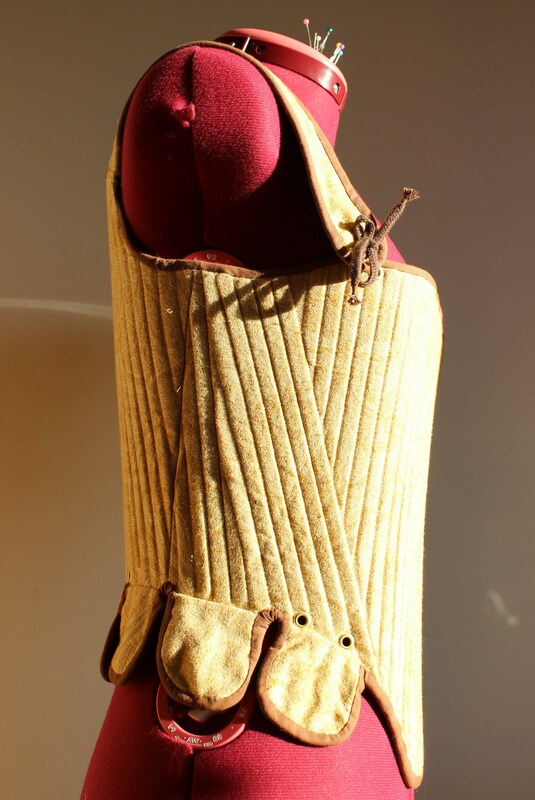 I inserted the bonning, set the gromets and sewed on the bias-tape. Unfortanly I didn’t think of documenting the steps while sewing (this was before my bloging days) so there are no construction photos. But there are finished ones. One thing I didn’t accounted for was the amount of fabric the bonning would “eat”. While inserting the bonning the corset shrunk quite a bit, and I ended up needing to do some piecing to make it fit properly. 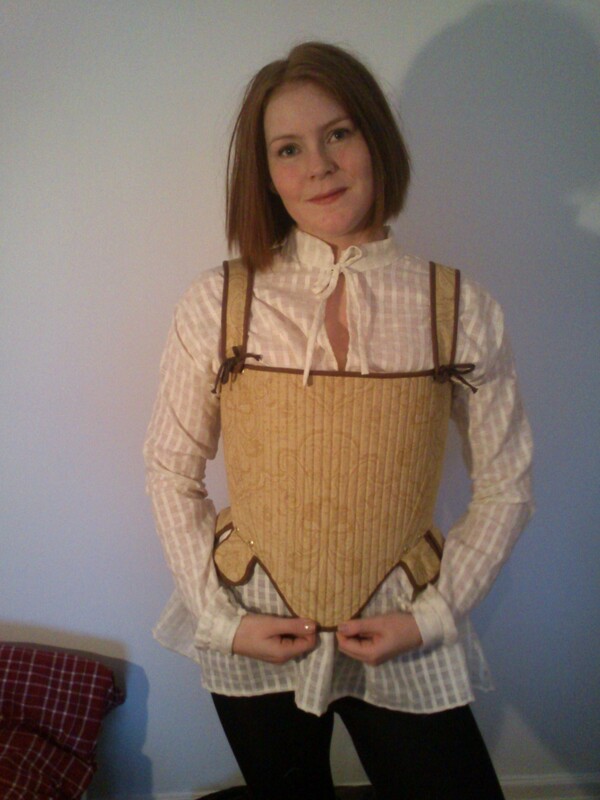 When the corset was finished I decided to also make a shirt to wear underneath. I used a lovely cotton voile, and sewed the shirt compleatly by hand (and still didn’t take any construction photos). 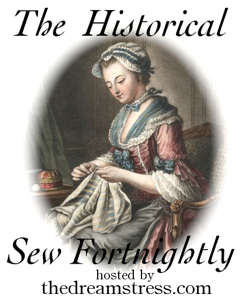 Pattern: Shirt – Janet Arnold “Patterns of Fashion 4 – c.1600-1610 smock. 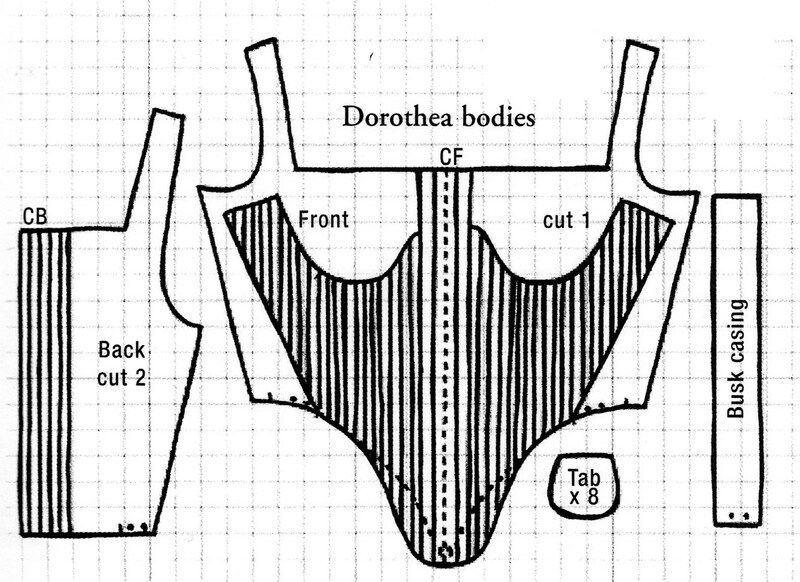 Corset – “The Tudor tailor” Dorothean bodies. 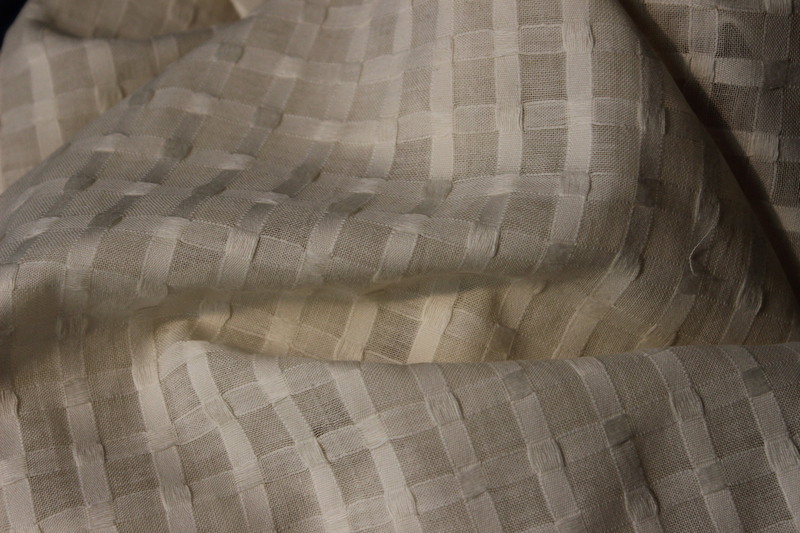 Fabric: Shirt – 2 m of checkered cotton voile. 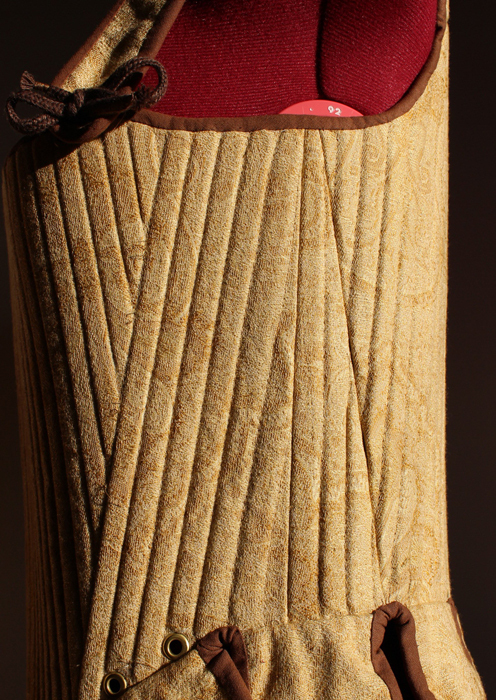 Corset – 0,5 m of leftover golden/yellow curtan-fabric, 1 m brown cotton for lining and interlining. Notions: Shirt – Thread. 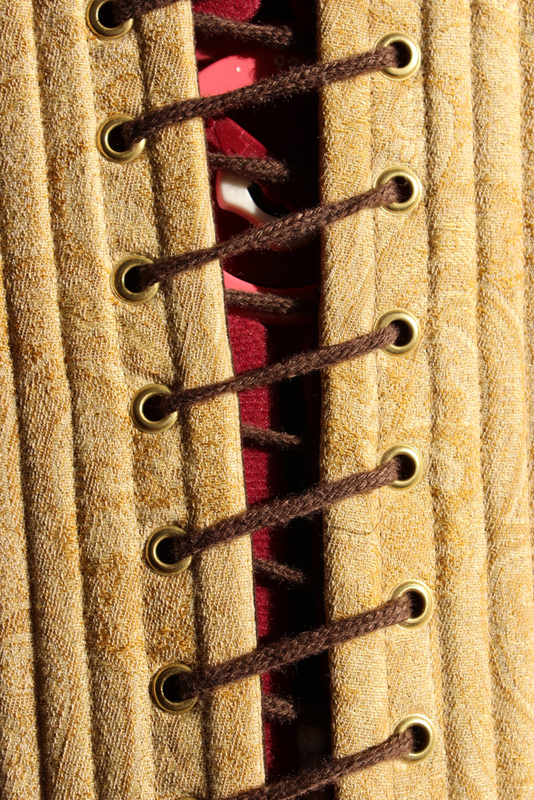 Corset – Thread, Bias-tape, gromets, boning and lacing cord. 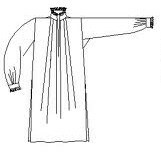 How Historical Accurate: Shirt – Completly hand sewn, but the cotton tread and fabric is not correct for the period. 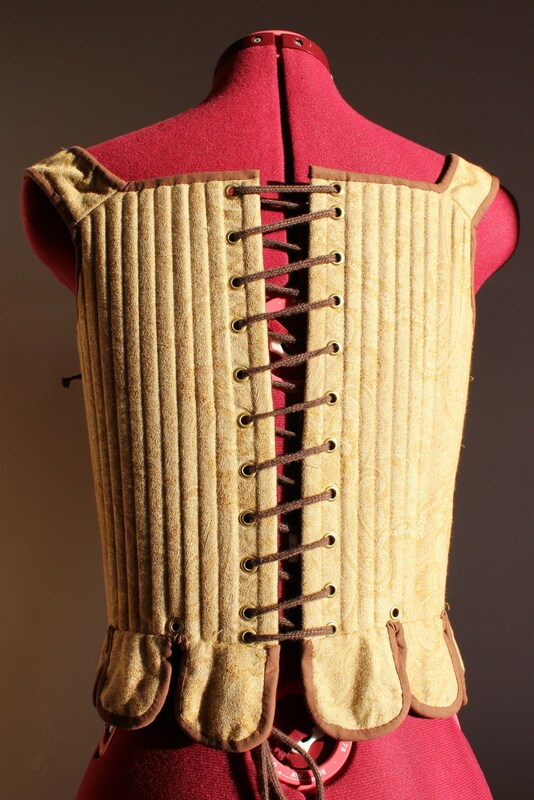 Corset – Not realy. 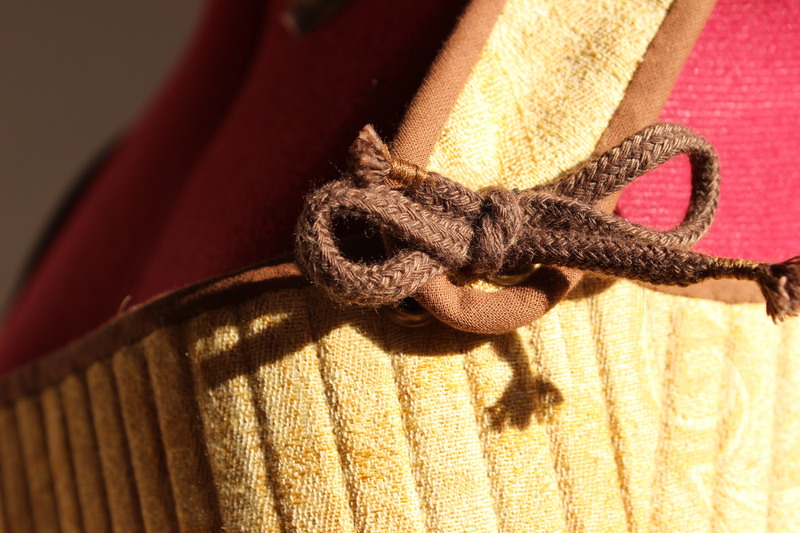 The achived shape is just about right, but all the sewing and material is modern. Time: Shirt – about 8 hours. 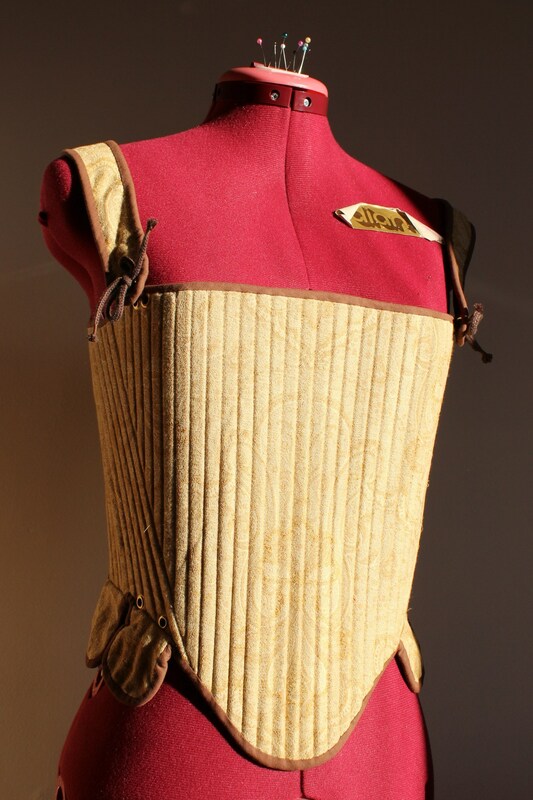 Corset – 3 Days of work. Cost: Shirt – 150Sek (16Usd). 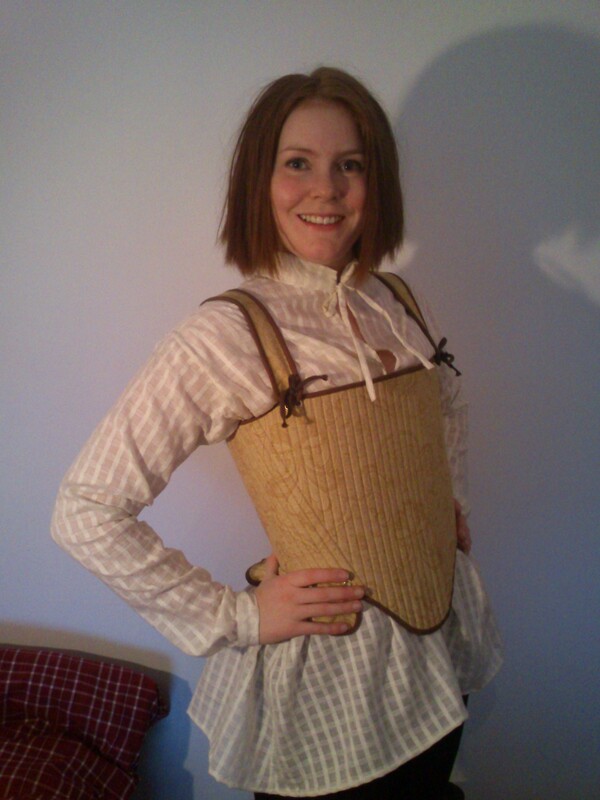 Corset – 300 Sek (40Usd). First worn: Only at photoshoots so far.